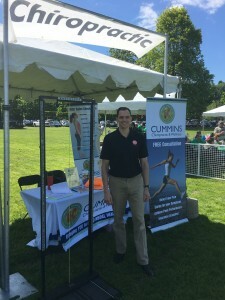 Dr. Bob Cummins volunteered at the annual Walk to Cure Arthritis by performing complimentary posture and spinal screenings at the Renton Cedar River Park over the weekend. Postural distortions may look very slight on the outside or they may be obvious. They can cause rapid degeneration of your metabolism and immune system on the inside or take years to manifest. Both systems are crucial for your overall health and vitality. Falls, car accidents, sports injuries, trauma and even the birth process can accelerate degeneration of the spine, lead to disability, and shorten life span. People with postural problems tend to be more depressed than others, experience chronic pain, may have more issues with relationships and may even earn lower incomes. Postural distortions and a weaker spinal structure can have a major effect on a person’s overall strength and health, which can even have an effect on their earning potential when in the workforce. Later, these distortions can cause accelerated aging and may make you feel older than your chronological age because there is interference in nerve supply to your organs, muscles and joints.